This Cheshire cat grin comes to my face when I watch the artists in the shows at the Moisture Festival. Seems like I was always drawn to skills, skits and bits that make people laugh. A good laugh is one of the best things humans can enjoy together. I was an Army brat – so I grew up in West Virginia, Scotland, Germany, Kentucky, Oklahoma and Washington. My mother, being from Scotland, loved singing and listening to good music. The radio was always on. We saw Ray Charles and Frank Sinatra together. My father was a hillbilly so I got a good shot of country music. I was in country, rock and roll bands and playing the Pike Place Market in Seattle, but it was through performing with the vaudeville troupe “DuCaniveaux” that I was introduced to the Oregon Country Fair and the fun of being a vaudevillian. 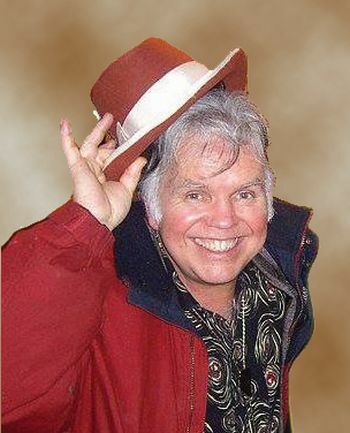 I was pretty much unaware of that label until Tom Noddy – the bubble guy said, “You are a vaudevillian, you are one of us.” Up to that point in my life I considered myself mainly a singer/songwriter, which I still very much love to do. It was at the fair that I began to really appreciate vaudeville and the variety arts. I absolutely loved the affect it had on audiences – it made them happy. Our troupe traveled to Europe on two occasions – about 10 -12 of us. We bummed around Paris, Amsterdam and Barcelona playing the streets and watching many fantastic acts. Eventually, through Tom Noddy and Hacki Ginda’s efforts (he is also part of DuCaniveaux), we performed with the troupe at his club, The Chameleon, in Berlin and also at a circus school in London. A particularly memorable recent adventure was going to Glasgow with some festival performers to put on a show as a benefit for The Britannia Panopticon – the oldest surviving Music Hall and the place where Stan Laurel debuted! Imagine our absolute joy doing a show on that same stage. Certainly some of my most satisfying years artistically have been helping to create and work on The Moisture Festival, made enjoyable because of the amazing producing team, our board, the volunteers who help to make it happen and the amazing line up of performers I have been lucky enough to meet. One thing is certain – without the creative energy that is inherent in the DNA of Seattle it would have been much more difficult to pull off. I sometimes act as the host for the shows and sing a song or two. More often I am behind the scenes or I am one of those happy audience members!